The 54th edition of the Civil Service Yearbook emerges into an era of transformation within the Civil Service. Since the decision to leave the European Union, the Civil Service has seen much transformation, including the creation of new departments and restructuring of others. The devolved administrations have also evolved their structures in recent years in response to changing circumstances and new challenges. The Civil Service Year Book is the indispensable directory for anyone who needs to find information on the structure, department and key personnel of the Civil Service. In so doing it facilitates the process of “opening government” up to members of the public. Dandy Booksellers would like to acknowledge and thank the many members of the Civil Service who helped to make this book possible. 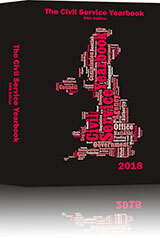 Copies of the Civil Service Yearbook and online subscriptions can be purchased from Dandy Booksellers.